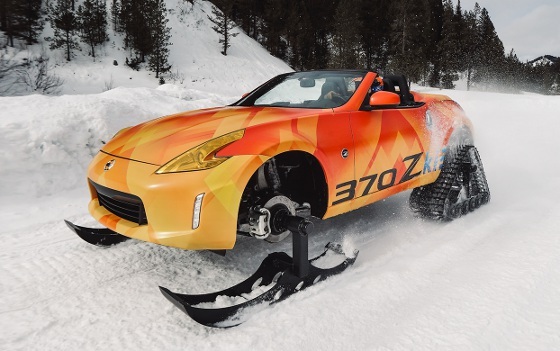 Arriving just in time to take on a snowfall, Nissan rolled out a one-of-a-kind 370Z Roadster snowmobile at the opening of the 2018 Chicago Auto Show in February. 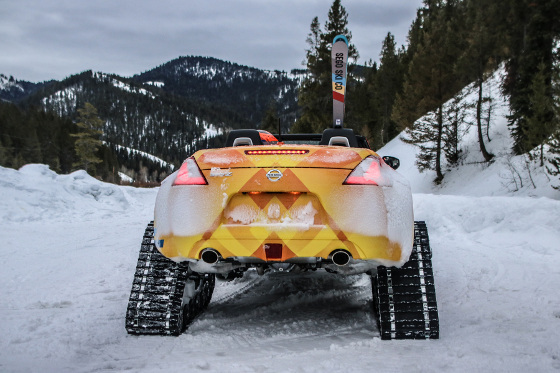 Dubbed the 370Zki ("370-Ski"), the car proved a transformational challenge for engineers and builders alike on the extended Nissan team. The factory stock 332-hp, 7-speed automatic V6 sportscar traded its high-performance tires for 56-in.-long skis on the front and 15-in.-wide tracks in back to become a snow track-carving thrill mobile that looks oddly at home (and a lot of fun) on ski slopes and backwoods trails alike -- once you see it running. Nissan says that to make room for the rear DOMINATOR Tracks from American Track Truck, the entire drivetrain was first removed. A custom lift kit was designed and engineered, so it could lift the vehicle 3 in. from the normal height. Next came fabrication of custom mountings for the rear suspension springs and 3-in. custom spacers to mount the snow tracks to the wheel hubs. The factory brakes were retained, but the brake lines had to be rerouted and the exhaust system was modified to fit under the vehicle. 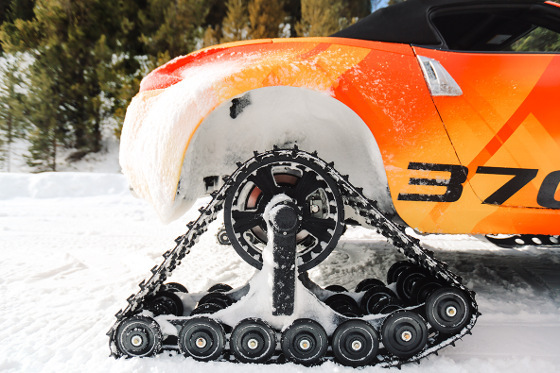 The rear wheel wells were also modified for clearance of the 4-ft-long snow tracks. The 370Zki retained its original factory spec steering. 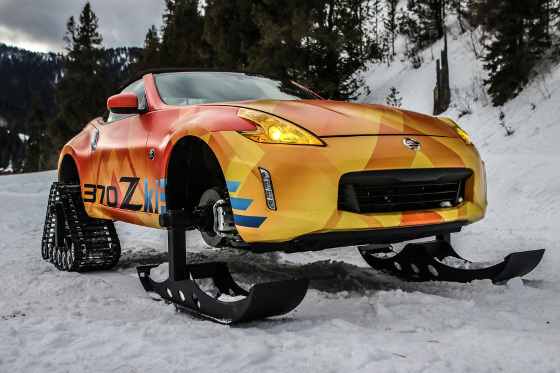 In the front, the original 370Z's suspension was modified to accommodate the new ride height, and adaptors were made to allow the appropriate travel and rotation for the front skis -- which were also supplied by American Track Truck -- and mounted with spacers to the stock wheel hubs. The engine and transmission also had to be custom mounted, and a front skid plate was fabricated to prevent damage during snow excursions. The vehicle features a cloth power-folding roof with fabric inner liner. Comparatively, the cosmetic changes were bunny-slope easy. The custom body wrap was created and applied by Icon Image Graphics, and the headlights were cleverly tinted yellow to produce a ski-goggle effect. 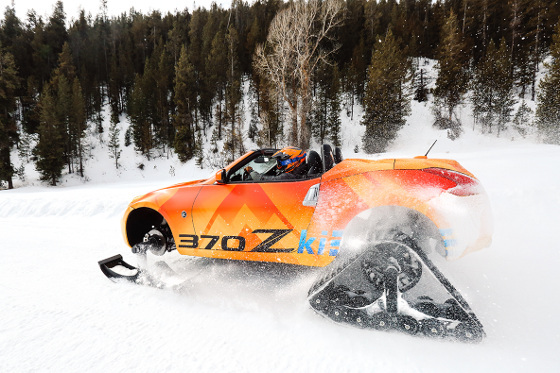 "Prior to its debut here in Chicago, we put the 370Zki through its paces on the slopes in Wyoming where its performance heritage really came through," said Michael Bunce, vice president, Product Planning, Nissan North America. "It's fun to shake things up with something totally unexpected once in a while," he said. The 2018 Chicago Auto Show ran Feb. 10-19 at McCormick Place.